While there are some rabbits who prefer having their human all to themselves, most rabbits enjoy the company of other rabbits. A second bunny can provide years of joy, fun and contentment for both you and your rabbit. But it may not be love at first sight for the two bunnies. Bonding rabbits can take time, patience, and persistence. When considering adding a second bunny to your family, oftentimes you can set up a “speed dating” session at a rabbit shelter. 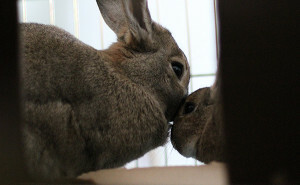 Although it doesn’t always happen, your rabbit could actually experience love at first sight with another rabbit there, making the bonding process much easier. Even if the shelter doesn’t offer speed dating, the staff will know the personalities of their available rabbits and may suggest one that would make a good bonding candidate. This is an added benefit of adopting a rabbit from a shelter/rescue as opposed to buying one from a breeder or pet store. Neutered/spayed rabbits are less aggressive and make better candidates for bonding. Male/female bonding is usually the easiest to achieve, and in this case, being fixed is a must. Even if your rabbit is generally gentle and calm, when a new bunny enters the scene, you may see some very aggressive behavior. Rabbits can bite, claw or swat at each other potentially inflicting great harm. For this reason, all bonding must be supervised. A good way to have your rabbits become acquainted is to place their pens/cages next to each other. By keeping a bit of space between them, you can avoid fighting. We kept our rabbits in separate rooms at the start of their bonding process. During their introductions we placed a baby gate in the doorway and enticed them over with veggies. The holes in the gate were small enough that they couldn’t get their mouths through to nip. It is also useful to swap litter boxes, toys and food dishes every few days to help get the the rabbits used to each other’s scent. For true face-to-face meetings, choose a neutral location since bunnies can be very territorial. This can be on a slippery kitchen floor, a hallway or the bathroom. It should be a fairly small space so they are forced to interact. It is absolutely crucial that you are pay close attention to your rabbits when placing them together. Arm yourself with a spray bottle of water to break up fights. An old tennis racquet can be useful to separate them if tensions rise. Protect yourself as well. Make sure your arms and legs are covered. You may even elect to wear gloves. Common actions between rabbits in a bonding session can include: chasing, nipping, swatting, spraying or mounting. Flattened ears or a lifted tail are both signs of impending attack. Beware of nipping on the nose or ears of the rabbits. Expect some fur to fly. If the aggressive acts get to be too much or one bunny is injured stop the session immediately. One thing to note is that both males and females mount in an attempt to show their dominance. Establishing dominance is key to the bonding process. Rabbits have to know where they stand in the social order. Bonding sessions can begin at ten to fifteen minute intervals. That time can be increased or decreased depending on the rabbits’ interactions. These sessions may be repeated many times before the rabbits feel comfortable with each other. Be prepared to be in it for a long haul. After each session be sure to check both rabbits for any injuries. 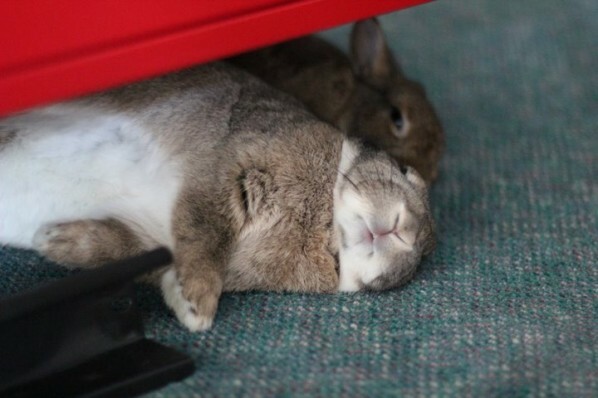 After a while, the two rabbits will come to accept each other, and with any luck, eventually display affectionate behavior like snuggling and grooming. Bonding can take a lot of time and effort, but the end result is well worth it. 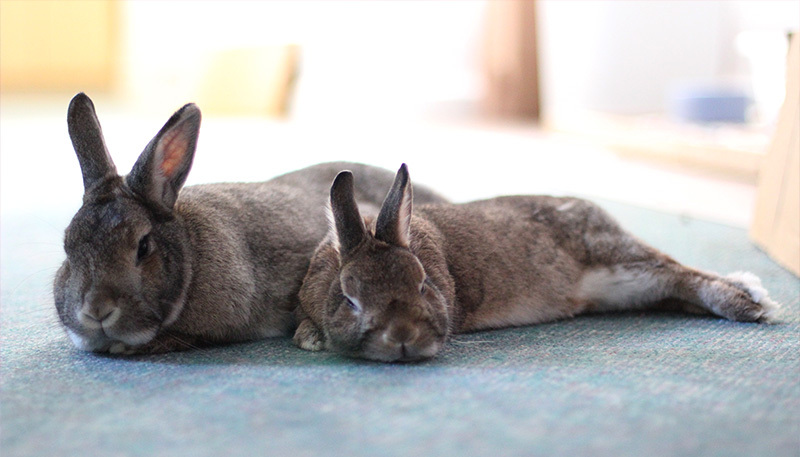 Bonded bunnies keep each other happy and entertained in the long term.